Over the last forty years, the human landscape of the United States has been fundamentally transformed. The metamorphosis is partially visible in the ascendance of glittering, coastal hubs for finance, infotech, and the so-called creative class. But this is only the tip of an economic iceberg, the bulk of which lies in the darkness of the declining heartland or on the dimly lit fringe of sprawling cities. This is America’s hinterland, populated by towering grain threshers and hunched farmworkers, where laborers drawn from every corner of the world crowd into factories and “fulfillment centers” and where cold storage trailers are filled with fentanyl-bloated corpses when the morgues cannot contain the dead. Urgent and unsparing, this book opens our eyes to America’s new heart of darkness. Driven by an ever-expanding socioeconomic crisis, America’s class structure is recomposing itself in new geographies of race, poverty, and production. The center has fallen. Riots ricochet from city to city led by no one in particular. Anarchists smash financial centers as a resurgent far right builds power in the countryside. Drawing on his direct experience of recent popular unrest, from the Occupy movement to the wave of riots and blockades that began in Ferguson, Missouri, Phil A. Neel provides a close-up view of this landscape in all its grim but captivating detail. Inaugurating the new Field Notes series, published in association with the Brooklyn Rail, Neel’s book tells the intimate story of a life lived within America’s hinterland. Rachel Kushner, author of "The Mars Room" | Bookforum, "Best Books of the Year"
"Tired of hearing from the so-called creative class? Frustrated with the complete failure of liberal elites to even comprehend what the problem is? Me too. This country, this world, is now utterly shaped by crisis and full of people living on margins—social, economic, and geographic—people who need not romantic elegies, hillbilly or otherwise, but studied attention by those able to understand history and its flows, who can report on the fine-grained life texture and large-scale patterns of populations both excluded from the economy and yet brutally integral to it. Globally, those who suffer most amount to a magnificent and terrible multitude. What is the logic of this crowd? Can they revolt against a social order that makes their lives expendable and cheap? Neel, in Hinterland, reports from far-flung places where people are forced to make do: a train full of migrant workers in southern China; Ferguson, Missouri; Jail Cell, USA. Neel writes in a visceral and stunning style of the slow apocalypse he everywhere finds, and he applies to these encounters a most unusual rigor. 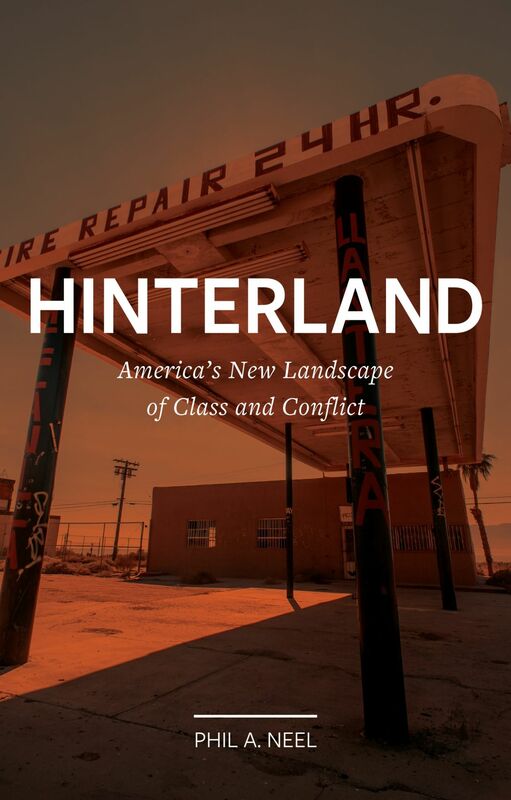 Hinterland is the geography lesson I’ve been looking for all year." "Neel draws attention to the geography of class in Hinterland, identifying both a new working class and the global forces that have shaped it. . . . It would be easy for Neel to claim to be an authority on class in rural America on the strength of his own upbringing, as authors such as J. D. Vance have done. . . . Neel deliberately avoids this strategy. . . . Instead of describing a sense of class that is anchored in a specific region, Neel emphasizes that upheavals and dislocation connect working-class experience across regions and continents. . . . Neel doesn’t propose to solve any current ‘What’s up in Trump country?’debates. Instead he sets out to show the transformation, and often enough the hollowing out, of large tracts of twentieth-century life as the product of global capitalism. Hinterland is hectic and unsystematic but often tonic, not least because few people who think this way have seen most of the places Neel has, let alone from the standpoints he has sometimes occupied—rioter, prisoner, day laborer. . . . [Neel’s book] honors the view from below or from the hinterland, where class is something that happens to you, like the weather but worse and more unrelenting. This emphasis has much to recommend it: ethically in its attention to lived experience, politically in its emphasis on concrete conflicts, intellectually in its alertness to variation and nuance. . . . A meditation on the opacity of class experience, to those who live in it but also to those who theorize it." "Simply bracing. It is easy enough in my cozy state-supported Canadian research enclave to ignore how my working life is connected to a bankrupt town in the US hinterland or to the Chinese proletarian traveling to wherever the jobs have gone. But Neel makes the unifying, underlying dynamics hard to deny—dynamics of dwindling state resources, growing demands stemming from unfolding climate catastrophe and rising superfluity, and deepening threats to government capacity and legitimacy. This is stark terrain that too few scholars glimpse with any clarity. Its implications are massive." Arlie Hochschild, author of the National Book Award finalist "Strangers in Their Own Land: Anger and Mourning on the American Right"
Steve Fraser, author of "The Age of Acquiescence: The Life and Death of American Resistance to Organized Wealth and Power"